Thankyou all! Please continue as it all helps! I have studied the Lesser Noddy at the Houtman Abrolhos, Western Australia for 25 years. New micro-GPS technology provides a unique chance to track this vulnerable seabird at sea. Lesser Noddies weigh 100g, nest on 3 islands, and their breeding season is shifting due to global warming. Where do they feed? How will this change with a warming Indian Ocean? Using GPS we hope to identify and conserve their foraging grounds. We are easily able to study a seabird when it breeds on land, but they spend most of their time foraging at sea. In 2015, Dr. Lousie Soanes successfully established a technique for deploying GPS on small seabirds. The Lesser Noddy is listed as vulnerable. It nests only on 3 islands, requires a specific tree to build nests in and is thought to have a limited distribution at sea. With the eastern Indian Ocean undergoing rapid change and the Lesser Noddy nesting season becoming laterand likely driven by their prey, we are interested in tracking their movements whilst foraging at sea to see if they are adapting to this change. Seabirds are marine animals, spending much of their time at sea. We can easily protect nesting areas of vulnerable species, but what if we do not identify changes they experience whilst foraging at sea? Prior to the development of micro-GPS, gathering data on seabird foraging distribution was difficult. Now, we can readily deploy GPS and unmask seabird behaviour at sea. If we can identify key areas essential for the Lesser Noddy to successfully raise their young, we may be better able to secure these areas as marine parks. If successful we will deploy our GPS units commencing October 2016 at the Houtman Abrolhos when the birds are at their nest sites sitting on eggs. It takes about 5 minutes to attach a GPS to each bird. During this process, we weigh and measure the adult, mark it with an approved colour band, and mark its nest. Once deployed we will return to retrieve the GPS after 2 or 3 days. On retrieval we will weigh the bird and assess its breeding attempt to ensure our techniques are not impacting upon the birds breeding condition. The GPS are then downloaded in the field and recharged back at base before being redeployed on a new bird. The funds raised will allow the purchase and deployment of new micro GPS units. The new GPS units will ensure that we are able to deploy enough GPS to establish sound baseline data on the at sea distribution of the Lesser Noddy. Without the funds it is unlikely we will be able to successfully track this species, and therefore be unable to advise on the critical marine habitat necessary for its survival. Currently we fund our annual field costs out of our own pocket including transport, accommodation and fuel at this remote field site. Local fishermen also contribute with logistical support. This project is vital for understanding the foraging habitats of a seabird in an area that has recently been subject to extreme warm water events. The micro-GPS tags are lightweight and attach to the tails with tape, thus very safe for the birds. 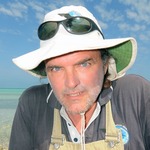 Dr Surman is a leading seabird biologist with a wealth of knowledge on the ecology of these seabirds. He is a dedicated scientist, passionate about the conservation of the terns. I first started visiting the Houtman Abrolhos as a child, beachcombing for shells and driftwood and dreaming of growing up to be a marine biologist. I was always fascinated with the marine environment and found myself watching the thousands of terns, noddies and shearwaters commute to and from their feeding areas over the horizon each day. Where were they going? What were they catching? As a student at Murdoch University, I used to sail my parents small yacht to the islands, and base my research from there. Now, after 25 years in the field as a marine ecologist, I hope to gain an insight into the Lesser Noddy foraging grounds by using GPS. I have extensive experience as a marine consultant in Western Australia, having worked for government agencies as well as the fishing, tourism and the oil and gas industries. I pioneered field programs for seabirds in many remote locations along the Western Australian coastline, including the establishment of long-term studies at the Houtman Abrolhos (since 1991), Lowendal Islands (since 2004) and on Barrow Island (2008 - 2013). I currently run a small environmental consulting business, but remain active in the seabird world. Our research at the Houtman Abrolhos celebrated its 25th season last summer, and we are proud to have self funded much of our research there. We have published our work on the impacts of climate variability (El Niño Southern Oscillation and the Leeuwin Current) upon seabirds and larval fishes at the Houtman Abrolhos Islands in several international peer-reviewed journals.